Modern-day job search letters are optimized for social media, mobile messaging, and the Internet. With such communications-supported job searches, you should strive for concisely written content with plenty of keywords, including performance verbs. Successful job-seekers also know how to craft great cover letters and how to write a counter offer in case a job offer is unsatisfactory. So make a splash! Engage hiring authorities through a communications-centered campaign with smart content. Savvy job searchers know the importance of web-optimized letters, cover notes, resumes, and other job-search correspondence. Web-smart content gives you an edge because employers use scanning technology to sift through myriad letters from job candidates. Digital quick reads. When sending messages on digital devices, try to design the information in “quick bites.” When information is buried or dense, even in longer letters, it can easily be overlooked. Your watchwords: short and succinct. One and done. Don’t double up your contact information with two e-mail addresses and phone numbers. One of each is all it takes for a reply. The practice of including a residential address is falling out of favor, but listing the region where you live (Dallas Metro) is helpful for two reasons: (1) an employer may resist paying relocation costs, and (2) because you are looking for local jobs only. E-mail covers. 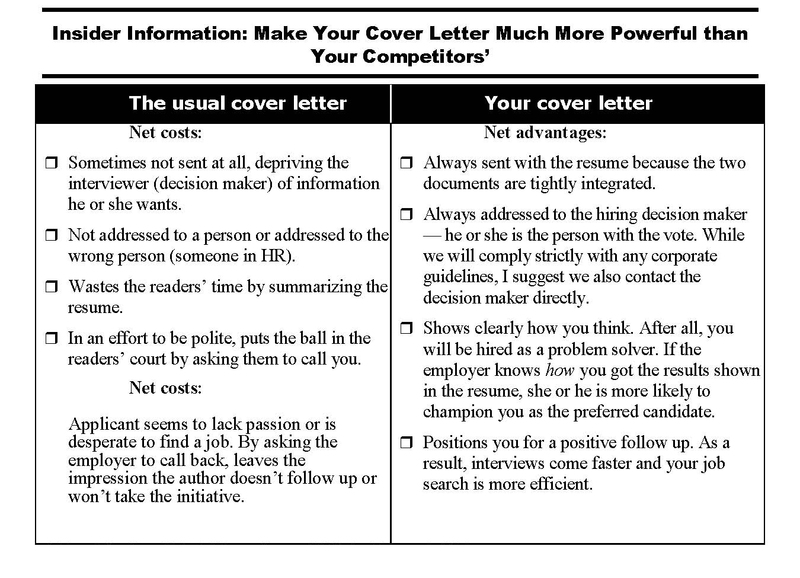 Cover notes (brief and to-the-point messages) often replace traditional cover letters when introducing online resumes. But think twice before being thrifty with words in networking covers that ask people to lend you a hand in your job search. Definitely go with a traditional cover letter or resume-letter combination when you’re prospecting for a meeting with employers who have never heard of you. Best words. When writing for a job, write with good spelling, punctuation, and grammar — unless you’re willing to be dismissed as inadequately educated. Save text abbreviations ( u no y) for pals and recommenders. Completed 30 credits toward Bachelor of Science in Business Administration. Expect to receive Bachelor of Science in Business Administration in [year date]. No double plays. Cover, networking, and prospecting letters should feature information — not duplicate a resume — that makes you stand out from the competition. Your aim: to open dialog — not to repeat yourself. High style e-mail host. It’s hard to believe, but styles in e-mail addresses apparently go in and out with the years. Gmail is currently the favorite, while AOL is sometimes described as “antiquated.” You can, of course, totally avoid dealing with the “lower and higher hemlines” of the digital world by launching your own website. But that’s a lot of work. Pocket-sized covers. Cover notes (brief and direct e-mail messages) often replace traditional cover letters for online resumes that are sent in reply to a job ad. But pause to consider before being thrifty with words in networking letters that ask recipients to give you a hand in your job search. Definitely use the full power of words in traditional covers for prospecting letters to employers who never heard of you or what you can do for them. Business card magic. Pictures on business cards (for college students, especially) are turning up everywhere as inexpensive online printers cut prices. Card links or a QR code point people to a card distributor’s mobile business card, work portfolio, Prezi, video, or a request for the reader to Google you. To write and to write well are two things. Craft your cover letter with the necessary points to have it jump out from the mainstream. Superstar professional writer Don Orlando of The McLean Group in Montgomery, Ala., explains in the following comparative checklist why a well-written cover letter gives you a leg up on the competition. Write a counter offer letter? Really? Well, suppose you’ve received a job offer, but it’s thinner than you expected. A counter offer (or counter proposal) might be the next appropriate move. Read the job offer and, if it disappoints, decide if you have the confidence to fight for what you want — in a businesslike way, of course. When the offer is under market value, consider taking the uncommon step of writing back with a counter offer letter. Do some crash research on the company; amend the specifics of the offer letter; and set up an immediate appointment with the manager, merely saying you need to review several specifics. Key message: Your counter offer letter affirms that you’re excited about the offer extended on [date] and look forward to accepting it. You plan to make a significant contribution to the profitability of the company. The terms of the offer are acceptable — with a few changes. Describe your hoped-for changes item by item. Limit them to important considerations, typically compensation. Close by saying that if these several modifications can be made, you’ll substantially outperform the manager’s expectations and show a rich return on the manager’s faith in you.